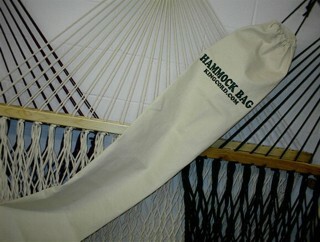 Kingcord Hammocks: Hammock Bags for Hammocks, Etc. Please click below to enter this item into your cart. Quick Ship: All items/versions in stock. - Ship in two days or less! These large, sturdy canvas hammock bags are very functional. Use them to pack away your hammock, when travelling, when you close the cottage for the winter, or simply after the weekend so you know nobody else will be lying in YOUR hammock! Size: 65" long x 8" diameter. Visit us at our workshop in the heart of the Thousand Islands, where experienced craftsmen still make each hammock entirely by hand. Saturday from 10 to 2. Summer Hours: 7 days a week, from 9 to 7. Kingcord.com is a secure ordering site, protected by Thawte. We respect your privacy. Copyright © 2017 Kingcord All rights reserved.